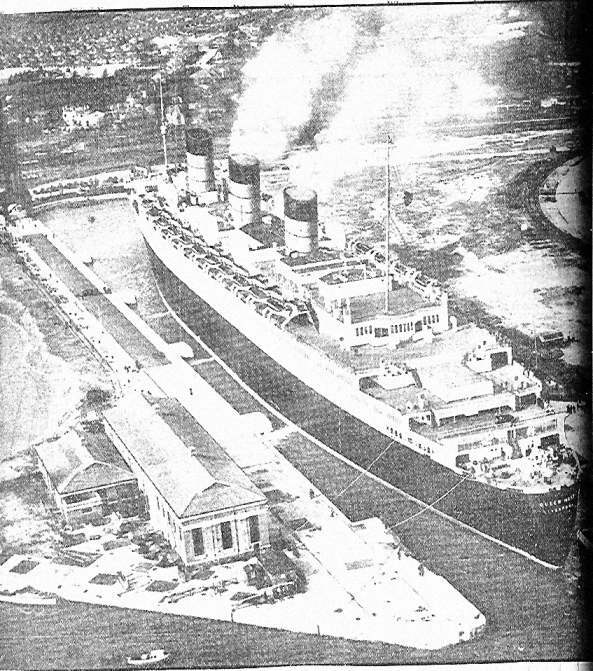 On 27 December 1930 the keel of the RMS Queen Mary was laid and, as an 80,000-ton ocean liner (actually 81,237 tons), she was finally launched on 26 September 1934. During April 1936 she underwent speed trials and on 27 May 1936 she made her maiden voyage from Southampton to New York. On 30 August 1939 she made her last pre-war sailing from Southampton before being conscripted for war service between March 1940 - September 1946. 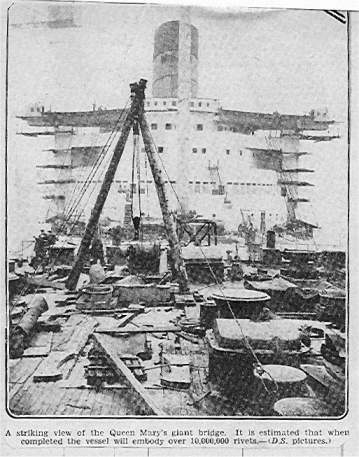 She departed from New York for Sydney, Australia, to be fitted as a troopship on 21 March 1940. Her accommodation was increased from 2,140 to 5,500. 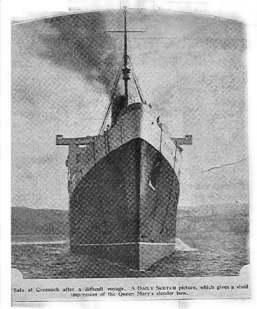 She made her first voyage as a troop transport on 5 May 1940 and sailed in convoy with the Aquitania, Mauretania (II), Empress of Britain, Empress of Canda, and Empress of Japan, from Sydney, Australia, to Gourock, Scotland, with 5,500 troops. On 9 April 1941 she was again in convoy, this time with the Queen Elizabeth and Mauretania (II) from Sydney to Suez, and back. 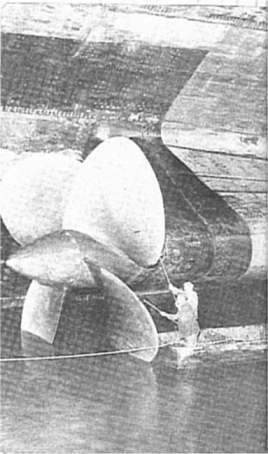 Between 27 January and 8 February 1942 her troop capacity increased, at this point in time her hull was damaged when entering the dry dock in Boston Naval Shipyard. Between 18 February and 28 March 1942 she sailed from Boston, USA to Sydney, Australia. 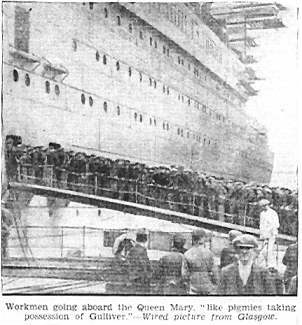 This was the first time the Queen Mary carried American troops (8,398 troops, 905 crew). A new record was set netween 11-16 May 1942 when, for the first time more than 10,000 persons travelled on her (9,880 troops, 875 crew). Another war time historical point was set between 2-7 August 1942 when for the first time a complete division was carried on any ship. This was the US First Armored Infantry Division (15,125 troops, 863 crew). 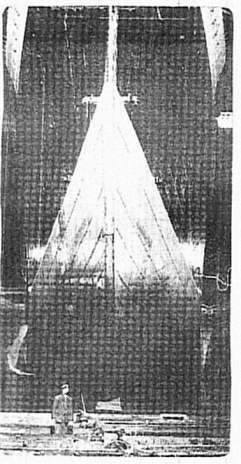 On 2 October 1942 she collided with British light cruiser Curcoa. 70 tons of cement were used to temporarily patch the bow in Gourock, Scotland. Between 23 December 1942 and 22 April 1943she sailed on a long voyage from Gourock, to the Suez, Sydney, Australia, and return to Gourock. The total mileage covered on this trip was 37,943 nautical miles.On her return she was transferred to the Atlantic Ocean. and between 5 - 11 May 1943 she trasnported Winston Churchill from Gourock to New York, to meet with President Roosevelt; 5,000 German prisoners of war were also on board. Between 25-30 July 1943 she again set another record by carrying the greatest number of persons on a floating vessel, 15,740 troops, 943 crew, a total of 16,683 people. The statistics during the war period speak for themselves, she carried a total of 765,429 military personnel, sailed a total of 569,429 miles (916,407 km), she carried up to 15,000 troops at one time, she carried wounded returning to the United States, she transported Winston Churchill three times to conferences and she carried 12,886 G.I. brides and children. She resumed peacetime passenger service on 31 July 1947 and on 19 September 1967 she was retired from passenger service after 1001 Atlantic crossings. For more information see the Official Queen Mary website or see the Virtual Tour site. These pictures were taken from the scrapbook of Mr Charles Earl, grandfather of Mel Gibbs of Kempston Rural, Bedford.